Today's bus system was never planned; it just evolved The trolleys, which pre-dated the buses, originated in Manhattan and operated over the Brooklyn and Williamsburg Bridges radiating outward. All service over the bridges was virtually discontinued by World War II, after the building of the subways. 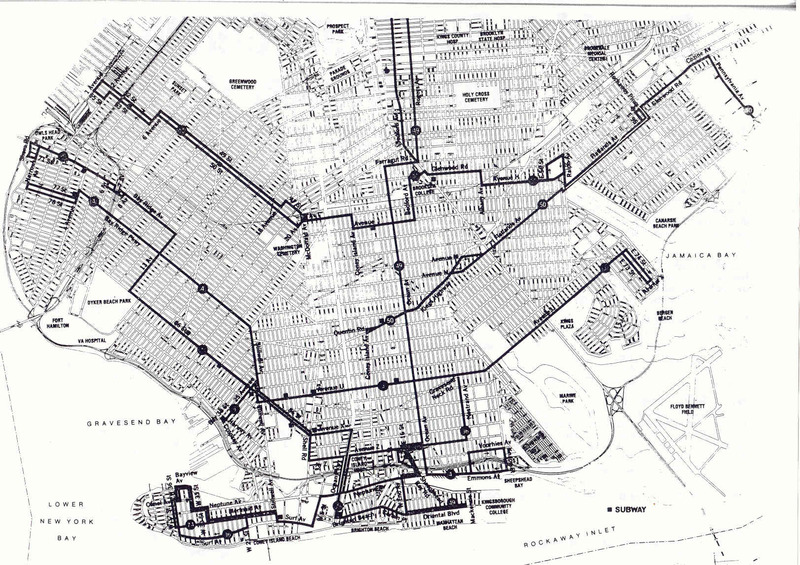 In the 1920s and 30s bus routes were added primarily in the east-west direction (North-South in Borough Park and Bensonhurst) to fill the service gaps not served by the trolleys. As trolley ridership declined in the late 1920s and 1930s due to the expansion of the subways and the Great Depression, many routes were consolidated over the same trackage and later the trolleys were converted to buses. Although the privately operated companies that originally operated the trolleys and buses no longer exist, the routing system in many areas remains basically unchanged. Development in the last fifty years has been served through an incremental patchwork of changes causing inefficiencies and unnecessary routing complexities. This type of planning resulted in bus routing service gaps that inhibit transferring and causes people to make indirect trips. Time is wasted and mass transit is discouraged. Below are just a few examples in Bensonhurst. Ø Coming from the Southern part of Fort Hamilton Parkway to Maimonides Hospital, you first have to go east to 13th Avenue then travel west to get to the hospital. Ø Traveling through on 13th Avenue requires you to first detour to Fort Hamilton Parkway before returning to 13th Avenue because until 65 years ago there was no bridge between 61st and 62nd Streets connecting the upper and lower portions of 13th Avenue. Consequently when the 13th Avenue bus route (B16) was instituted, the only way to continue further south was via the Fort Hamilton Parkway Bridge, since it was not possible to connect both portions of 13th Avenue anyway. However, although a neighborhood shop owner, Dominick Sabatino, saw the need to connect the two neigborhoods in the 1930s and convinced city officials to construct the bridge, since 1937 no one has been able to convince the city to modify its bus and trolley routes to operate two separate routes, one along Ft. Hamilton Parkway and another along 13th Avenue instead of having a single route perform double duty. Ø Going west from 60th Street to 13th Avenue South is not even possible with two buses. You cannot even use the 60th Street route, which would be the most logical choice. You first have to walk to either 18th Avenue or Bay Parkway, and ride south indirectly to 86th Street before traveling back north on 13th Avenue. There are instances in other neighborhoods where it is also necessary to use indirect routing. Two prominent examples are the service gaps along Empire Boulevard and Clarkson Avenue. The success of the comprehensive planning approach is evidenced by the success of the Southwest Brooklyn routing changes implemented 25 years ago as a result of a study initiated by the Department of City Planning. 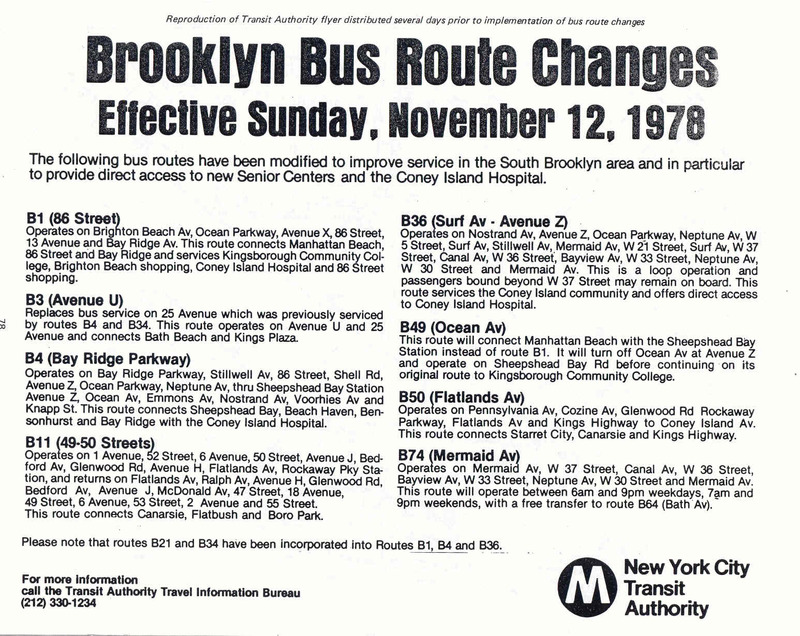 Ten routes were created combined or modified on November 12, 1978. Although bus service generally operates less frequently today than it did 25 years ago, service on the B1 rerouted along Brighton Beach Avenue, is nearly three times as frequent as its predecessor, the B21 because of increased demand. As successful as the 1978 changes were, they didnt go far enough in scope because they were limited only to Southwest Brooklyn and the TA only accepted about 25% of City Plannings proposals detailed in its publication, "Routes". In 1980 and 1981 as well as in 1993 and 1994, the TA also attempted comprehensive studies that did not result in any substantive changes and it is now official policy to make all changes incrementally, one or two bus routes at a time, with the emphasis on cost-cutting not on improvements. Improvements will be made, but they will be coupled with unnecessary inconveniences such as the discontinuance last year of a portion of the Cypress Avenue bus route that resulted in the removal of bus service for 500 daily passengers in order to provide through service between Williamsburg and East New York. Also the institution of through service along Ralph Avenue was provided at the expense of making east-west service in Crown Heights and Ocean Hill more inconvenient in an effort to reduce costs. We are really not improving the system when we solve some problems while creating new ones. CBT believes the only way to adequately solve the routing deficiencies that exist is through the comprehensive approach. Continuing to study the system one or two routes at a time, it will take about a hundred years to solve all the routing problems that exist today. This is why CBT is picking up where City Planning left off by issuing "Routes 2." If it generates enough interest, we will next focus our attention to Northern Brooklyn.